Bicycle infrastructure designs by IM dangerous for cyclists. Cyclists are reluctant to use the new bicycle roundabout lanes as they encourage left hooking and vulnerable conflict with vehicles. New shared lane in the service road. Sharrows have been placed at the left of the lane, positioning cyclists in the door-zone of parked vehicles. It is unclear who shall have right of way in the new bicycle roundabout lanes designed by Infrastructure Malta. Our proposals to shift bicycles away from the car lanes outside the roundabouts so far have not been taken up. The Bicycle Advocacy Group is deeply concerned about the safety of the new roundabout designs implemented in Triq L-Mdina, Ħaż-Żebbug. The roundabouts have been downsized to accommodate two car lanes, and feature a bicycle path on the periphery of these roundabouts. 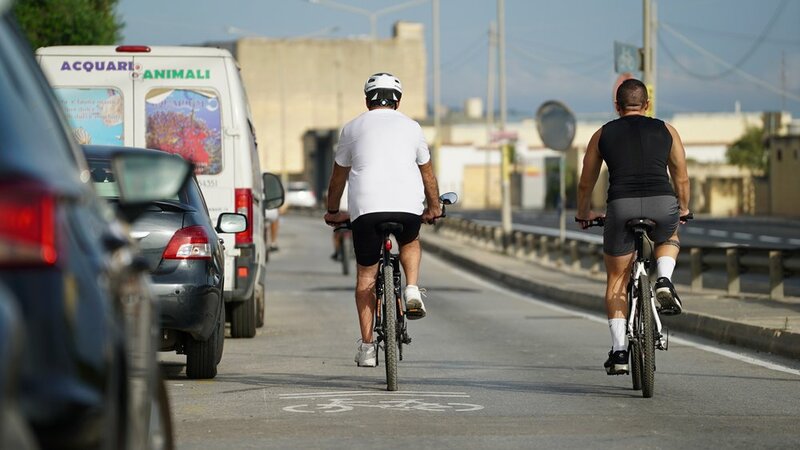 The new bicycle design as being used by Infrastructure Malta is only used in other countries where roundabouts are built in secondary roads and only feature one car lane and slow moving traffic. 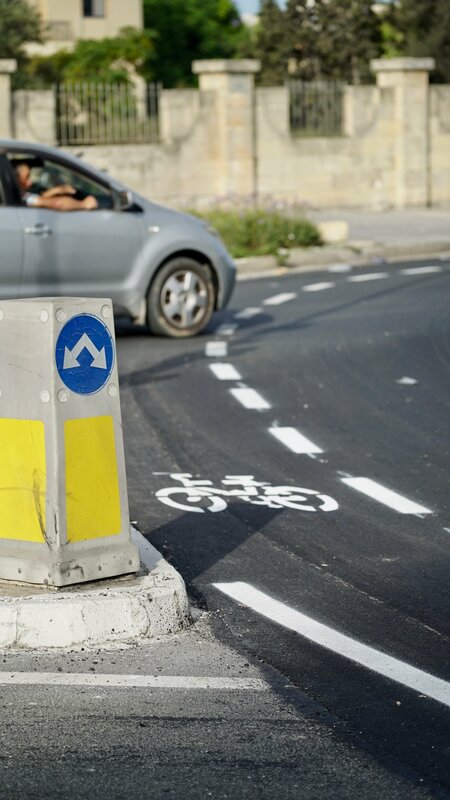 Back in July, BAG had already internally expressed its concern to Infrastructure Malta about placing cycle lanes at the bends of high volume roundabouts. The cycle lanes are too narrow and in any case unrealistically require cyclists to take the curving perimeter rather than the most direct route on the roundabout. By sticking to the cycle lane, cyclists risk being cut up or left-hooked by moving cars, especially when drivers take the 3rd and 4th exits. he cycle lanes also bring cyclists closer to drivers entering/exiting the roundabout, which is where most collisions, involving cyclists, occur. We had proposed the idea that the majority of countries are implementing infrastructures where cyclists are given the chance to entirely avoid the roundabouts by providing safe crossings from the sides instead (even for pedestrians). Whilst we welcome bicycle features at roundabouts, this must be done safely without adding additional risks for bicycle users, especially when these roundabouts are widened, making bicycle users even more vulnerable and potentially leading to fatal accidents. BAG questions who shall be given the right of way when drivers and cyclists intersect each other on these roundabouts, which are not found in arterial roads throughout Europe. BAG also expresses its disappointment for the entire removal of the bicycle lanes in Triq l-Mdina to add another car lane. Cyclists are now forced to share the road with fast moving traffic, although it is unclear how conflict will be avoided and no safety features are in place. The implementation of sharrows should not be seen as an alternative to safe cycle infrastructure where there is a flow of high moving traffic. BAG had proposed plans where bicycle users avoid the roundabouts throughout without altering traffic vehicular flow. Such roundabouts, which commonly feature in major road networks throughout Europe and work successfully, would have been a first for Malta. Moreover, recent articles in the media which suggested that BAG had been consulted numerous times on this project is false, as these plans were only showed to us when they were all but finalised during a meeting specifically set up for discussions on the Central Link Project. After reviewing these plans, we have again proposed changes to the roundabout designs, however, no feedback about these proposals were ever received, despite several reminders. BAG is concerned that the entities coordinating these road projects fail to understand these basic needs for bicycle users despite several efforts to point these out, while the National Cycling Policy is still not launched and no bicycle commissioner appointed. If the architects are under the impression that this type of infrastructure is safe for cyclists, we would like to invite them to publicly try it out for themselves during rush hour. These designs go against the Luxembourg Declaration on cycling signed by all EU Member States, including Malta, and more recently the Valletta Declaration on road safety, signed in Malta during the Maltese Presidency of the EU. These designs also contradict Transport Malta’s own National Transport Master Plan 2025 and National Transport Strategy 2050. Triq l-Mdina, Ħaż-Żebbug is one of the most widely used road by all types of bicycle users, those commuting and those riding it for leisure. Such short term supply-fix car measures will further encourage the use of the private car. Both south and north bound advisory bicycle lanes have been lost to accommodate another car lane. Sharrows have been placed as an alternative, for BAG this is unacceptable.